A Waterbury nonprofit has been named a semifinalist for a $100 million grant award in an international competition. The Himalayan Cataract Project announced Wednesday that the organization is one of eight from around the world to make it to the final round of the 100&Change grant competition sponsored by the MacArthur Foundation. When Job Heintz, chief executive officer for the organization, heard the news about two weeks ago, "I sat down," he said. "It's exciting beyond compare." 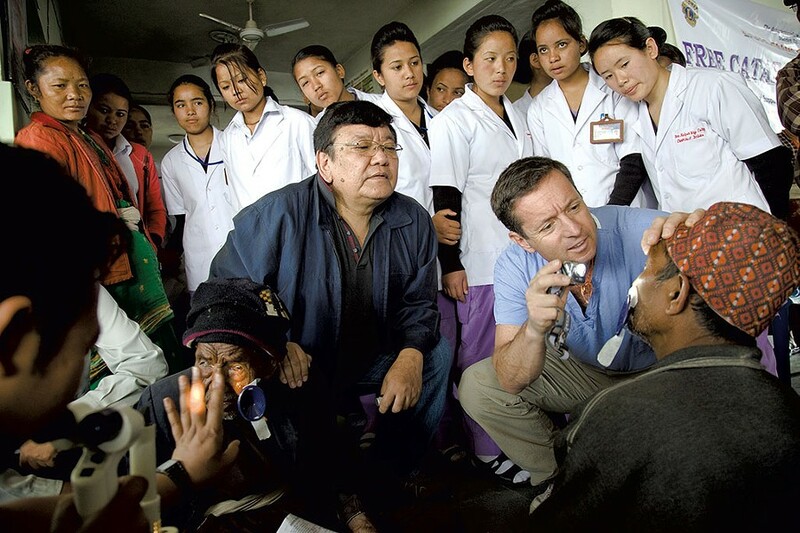 The Himalayan Cataract Project, which has a budget of just under $10 million, performs low-cost, en masse cataract surgeries in remote locations around the world. The grant money would be used to eliminate needless cataract blindness in three countries — Ghana, Ethiopia, and Nepal. The Chicago-based MacArthur Foundation launched the 100&Change grant competition last year to "solve critical problems of our time," according to a press release. The funds can be used for up to six years. HCP was selected from 1,904 proposals from around the world, according to the press release. About 800 went on to the second round, and the final selection was made by MacArthur's board of directors. The proposals were judged on four criteria: verifiability, durability, meaningfulness and feasibility. Over the next six months, HCP will receive training and technical assistance from the MacArthur Foundation to refine its proposal. Next September, the foundation will select five finalists who will present at a live event in December. HCP was founded in 1994 as the result of a partnership between Dr. Geoff Tabin, who lived in Vermont at the time, and Dr. Sanduk Ruit of Nepal. Since then, they have performed 6.6 million cataract surgeries in a dozen countries at a cost of $25 per surgery. The grant money would create "an adaptable 'train the trainer' model that can be replicated and scaled around the world," according to the MacArthur Foundation website. The money would be used to train more health professionals, provide equipment and "increase the innovation," Heintz said. HCP also plans to partner with IBM Watson Health to create a platform to log surgeries and track their data more comprehensively. HCP will pursue the work regardless of whether they win the competition, Heintz said. "Boy, 100 million would help," he added. Other semifinalists include the Internet Archive's project to provide free digital access to books for libraries and students, the Carter Center's effort to cure river blindness in Africa, and the Human Diagnosis Project's proposal to offer underserved American patients "virtual access to specialist medical care." After being selected from 1,900 applicants, the odds are "a heck of a lot better," Heintz said. "We're very confident in what we proposed to do. We're also very aware and humbled by the other semifinalists." Heintz highlighted the benefits for Vermont as well. "It'll bring a ray of hope to the state, to the NGO community here," he said. "We started here, stayed here, and are growing here."